Over the past few weeks, there have been a growing number of voices that have been declaring that the recession is over. Ben Bernanke, who is the Fed Chairman, was recently quoted as saying that the "recession is very likely over at this point." Mark Vitner, who is a senior economist at Wachovia, recently spoke at a breakfast and declared that "we are in the early stages of the economic recovery." Professor and economist Roger Tutterow also recently declared that the recession likely ended in either July or August. You get the point - the list of economists and government officials who are increasingly optimistic about the economy is growing longer and longer by the day. Don't include Nobel-winning economist Joseph Stiglitz in that group though, as he recently stated that he believes the recession will end in 2012, not 2009. 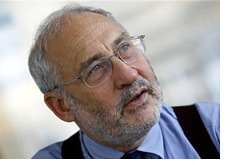 Even if you disagree with Stiglitz, you still need to hear what he has to say. Stiglitz won the Nobel Memorial Prize in Economic Sciences in 2001, and was formerly the Chief Economist at the World Bank. Stiglitz is currently a professor at Columbia University, and Newsweek recently stated that "Stiglitz's work is cited by more economists than anyone else's in the world." In other words - he knows what he is talking about. Stiglitz recently stated that "we would be lucky to be out of recession by 2012", and that a lack of new jobs would sink any potential short-term recovery. Now, some people will take exception to these comments, pointing out the fact that a recession is defined as being at least two straight quarters of negative growth. If we have one positive quarter, however weak that it may be, then the recession will have technically come to an end. Stiglitz argues that this is just a technicality, and that the recession won't be officially "over" until we have strong job growth and rising wages once again. Stiglitz argues that there are "many bumps ahead" and that the United States remains "deeply wounded". He cites the end of President Obama's stimulus program and continued weakness in the banking sector as two major hurdles that the US economy will need to get past before any meaningful recovery can take place. It's hard to argue with Stiglitz on these points, and there is definitely a strong likelihood that the United States may suffer through a double-dip recession. At the end of the day, the economy won't start to meaningfully improve until people start getting back to work. When people start working again, then consumer confidence will begin to rise. When consumer confidence begins to rise, then people will start spending their money again. Will that happen over the next couple of months? Or will this take years to accomplish?